To understand gentrification, you have to understand how money makes and breaks neighborhoods. Picture a faucet. Turn the faucet on, water flows. Turn the faucet off, everything dries up. Economically, this is what happens to neighborhoods when capital (aka wealth or investment) floods in and out. Turn the faucet on, capital flows into a community. People find decent work. They can afford to live in a safe environment. When they need to get loans, they can get them on good terms. People can invest in their homes, their families. Tax money keeps public things working: schools can educate, roads aren’t screwed up, playgrounds and pools are maintained, services that people need are fully funded and functional. Now turn the faucet off. Stop the flow of capital, everything dries up. People can’t find work, or the work that’s available is low wage, exploitive, predatory, or limited to street hustles in the informal economy. The physical environment breaks down. Landlords no longer see a profit in keeping buildings livable. Community violence sparks up as people war over limited resources, or explode violently due to constant psychological trauma. Banks refuse to lend money for anything within the neighborhood’s boundaries (a practice known as redlining). Homeowners looking to fix their homes can’t get money to do it. The only credit available is so high-interest, it drives people deeper into debt. As income falls off, taxes that once funded schools or other basic services disappear. Everything breaks. Those who can afford it usually leave. Those that stay face constant struggle. Gentrification is part of this process of neighborhoods getting built, broken, and rebuilt for profit. After the flow of capital dries up, the price tag on land and buildings drops. The same class of developers/investors who once made money off of leaving residents to die, now gobbles up their homes and storefronts. They buy up the block cheap and make profit, displacing the old residents while replacing them with wealthier/whiter people and institutions. This is literally where the term gentrification comes from: filling the neighborhood with gentry (people of higher socioeconomic status). The government plays an important role in this process. Politicians pass laws to help developers profit. They use up taxes and public resources on projects designed to serve and attract gentrifiers. They push policies that allow for easy displacement or eviction of former residents. Police increase patrols in gentrifying areas — criminalizing long-term residents and restricting the movement of racially targeted/working class individuals. Sometimes, state agencies will seize property owned or inhabited by old residents using eminent domain (the state’s power to take property for “public” good). Seized properties can then can be handed to developers, demolished to clear ground for new construction, or residents can simply be cleared out. Non-profits, Community Development Corporations, and large institutions like universities and hospitals often push the process forward as well. They use their power and resources to reshape communities that rely on them for jobs and services. Philly has seen this before. The wealthy neighborhood we know as Society Hill was an early example of planned gentrification. Historically a Black and working class community, the area had suffered after WWII because of economic decline and white flight (the exodus of whiter/wealthier residents out of cities). In the late 1950s, Philly’s Redevelopment Authority took over “blighted” properties in the area and gave them to the non-profit Old Philadelphia Development Corporation. Owners had to pay for expensive renovations or they lost the property. Those without resources or whose landlords wouldn’t pay were forced out. The Dock Street Food Market was pushed into South Philly to clear ground for apartment towers. As original residents were cleared out, suburban rich were recruited to take their place. Within a generation, memory of the neighborhood’s Black and working class character is mostly forgotten. This same story repeats itself across Philly’s working class neighborhoods as residents find themselves pushed out or priced out. The Black Bottom became University City. 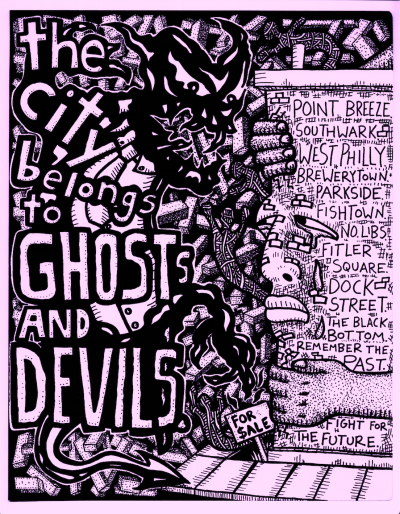 Fitler Square and Devil’s Pocket became Graduate Hospital or “South of South.” Today, we see gentrification in Strawberry Mansion (“Brewerytown”), North Philly, Kensington, Point Breeze, and farther into West and Southwest Philly. Rents are rising. Homeowners get pressured to sell as their rising home values increase property taxes beyond what they can afford. Low-income residents who held on through decline are rewarded with housing insecurity, the dismantling of their old community, and the prospect of eviction into an even rougher neighborhood. Even early gentrifiers eventually find themselves priced out as later waves of gentrification raise the cost of living higher and higher. Despite its harm, gentrification is often celebrated as a path to economic “revitalization.” In reality though, it is part of a larger cycle of exploitation that treats the communities we live in as commodities to be bought, sold, and speculated upon. Throughout the country, organizers fight to break this cycle. In Philly, the Tenants Union works to build the collective power of renters against exploitive landlords. In Jackson, Mississippi, the socialist organization Cooperation Jackson seeks to create co-ops, community land trusts, and a solidarity economy in order to build capital outside of the market that is controlled by the city’s Black and Brown residents. Nationally, coalitions like the Right to the City Alliance build networks between organizations that view housing struggles as core struggles for economic justice. These fights are increasingly urgent for those threatened by disinvestment or displacement.